Fantasyland could be considered the land that started it all. It greeted guests on opening day in both Disneyland and Walt Disney World, and it is quintessentially Disney. Some of Disney’s most loved characters and attractions are in this land. Cinderella Castle is the backdrop adding to the magic. 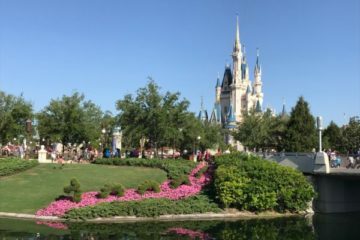 In Disney World, Fantasyland experienced Magic Kingdom‘s largest ever expansion with lots of old attractions closing and several new attractions being added. To show just how large Fantasyland is, consider that there are three smaller areas, or subsections, within Fantasyland: Enchanted Forest, Storybook Circus, and Castle Courtyard. Let’s take a look at everything there is to see, do, and eat in Fantasyland! One very important and significant addition during the New Fantasyland expansion was the construction of a third station on the Walt Disney World Railroad line. Prior to 2010, there were only two stops: one at the front of the park and one in Frontierland. Now, you can hop on at Fantasyland and head to the front of the park, passing through Tomorrowland by the Tomorrowland Speedway and Space Mountain, after you’ve explored the first half of the park. Head back to your resort hotel for a mid-day break, and when you get back to the park, hop on at Main Street USA, return to Fantasyland, and continue your adventure! The Barnstormer in the Storybook Circus section of Fantasyland is a short, family-friendly roller coaster with a minimum height of 35″. The Great Goofini (the circus version of Goofy) hosts the ride. Guests board cartoon biplanes and fly up and down gentle hills and through a barn. The ride is exciting, but it’s certainly not a thrill ride. Parents can ride with kids, but if this is their first roller coaster, you might want to stand back and snap some pictures! There are plenty of places to stand around the ride to catch all your kids’ first reactions. 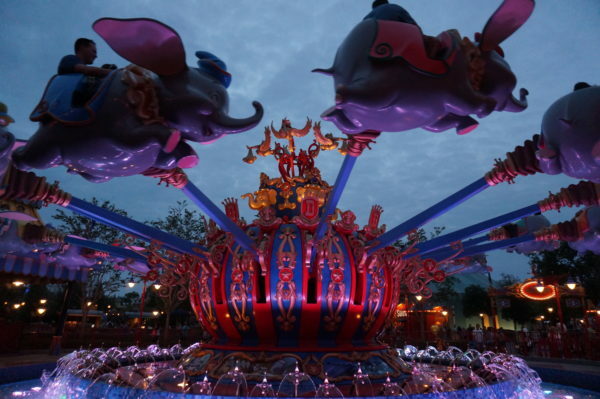 Dumbo the flying Elephant is based on the classic Disney story of Dumbo. While this ride is little more than an aerial carousel, it still gets busy at times. The really unique thing about this attraction is its queue. When you get in line, the Cast Member will give you a pager. You’ll take this pager and go to a nearby circus tent where you’ll find a play area with a – surprise – circus theme. There are a ton of photo ops inside the tent, so snap away! When the pager goes off, you can head to the ride’s gate where you’ll board shortly. Fly high over Storybook Circus in Dumbo! The wait time for this ride is sometimes long, but the playground makes the wait bearable. Regardless, I would suggest getting a FastPass+ to cut down your wait time. Disney did install a second carousel in the New Fantasyland construction, which helps keep wait times lower. Casey Jr. Splash ‘N’ Soak Station is also in Storybook Circus. Casey Jr, the train seen in the Dumbo movie, leads a water play area where kids and adults can splash around and cool off on hot Florida days. Whether or not you think you’ll end up here, bring a change of clothes because if you or your kids partake in the fun, you will be soaked as the name suggests! Pete’s Silly Sideshow is inside the circus tent near Dumbo the Flying Elephant. Inside, you’ll meet four of the Fab Five dressed in their circus best including Donald Duck as The Astounding Donaldo, Goofy as The Great Goofini, Minnie Mouse as Minnie Magnifique, and Daisy as Madame Daisy Fortuna. They’re separated into two separate queue lines with Daisy and Minnie in one and Donald and Goofy in the other. If you want to meet all four, you’ll have to wait twice, but if you’re satisfied with just meeting two, you won’t have to wait as long. Enchanted Tales with Belle takes us from Storybook Circus to the Enchanted Forest. This magical walk-through attraction allows guests to meet characters from the Beauty and the Beast movie. You enter through Maurice’s cottage (Belle’s home) then walk through his workshop and finally enter Beast’s Library. Besides encountering characters in each room, you’ll also interact with them. First, Madame Wardrobe chooses an audience member to help reenact a moment from the movie then Lumiere hosts a surprise party for Belle, and you’re all invited. 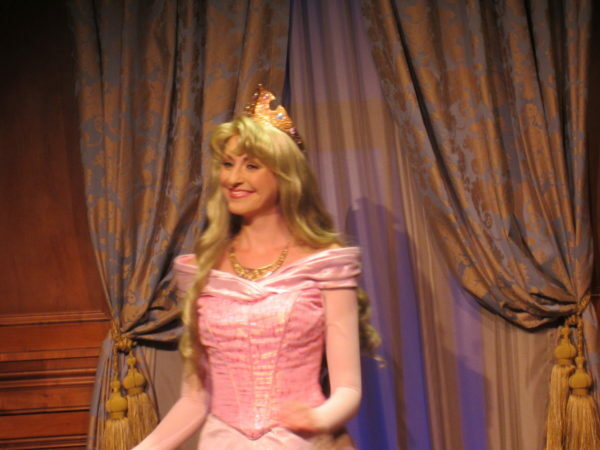 In my opinion, Enchanted Tales with Belle has redefined the concept of a character meet and greet, and has raised the bar for all future interactive shows. Don’t miss it! The Seven Dwarfs Mine Train attraction in the Enchanted Forest was part of the New Fantasyland expansion, and was one of the largest additions. Snow White’s Scary Adventures closed as part of the expansion, and the Mine Train, in a way, took its place. It’s much more appropriate for the area since Snow White’s Scary Adventures was often considered too scary for young children and even some adults. 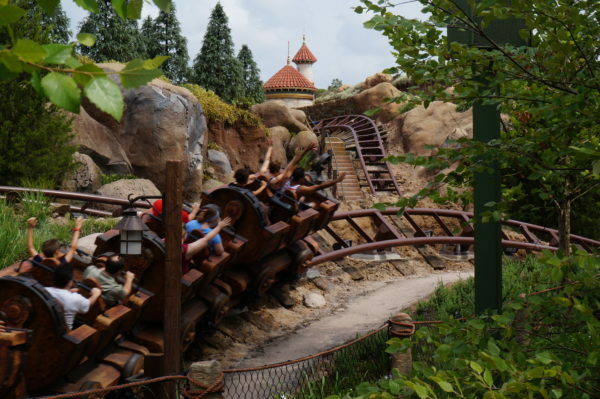 Seven Dwarfs Mine Train is a fun new addition to Fantasyland. Under the Sea ~ Journey of the Little Mermaid in the Enchanted Forest is an elaborately themed, classic Disney dark ride attraction set in Prince Eric’s Castle at low tide. The outside of the cavern is much better themed than the same attraction in California Adventure, but the ride itself is identical. After riding Under the Sea, head over to Ariel’s Grotto, near by in the Enchanted Forest, and meet Ariel in her Grotto. Ask her about her treasures and tell her about your own! She loves making new – human – friends! 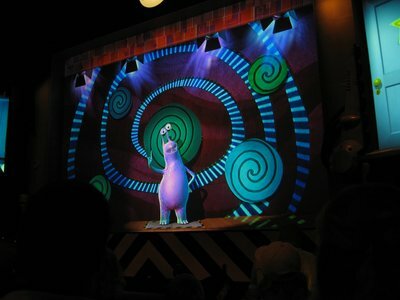 it’s a small world is based on the 1964 New York World’s Fair Children of the World attraction that filled the UNICEF Pavilion sponsored by Pepsi. The original attraction as well as the one in California had an outside facade, but the one in Disney World has an inside facade because of the frequency of inclement weather in Florida. Regardless of where the attraction is located, it always includes singing and dancing dolls representing cultures from around the world and the well-known song by Disney’s famous Sherman Brothers. The song is not copyrighted because they wanted it to be able to be shared and played anywhere anytime. The Mad Tea Party, also in the Enchanted Forest area, is another classic Disney attraction. It’s known for inducing motion sickness from the spinning style of the ride. 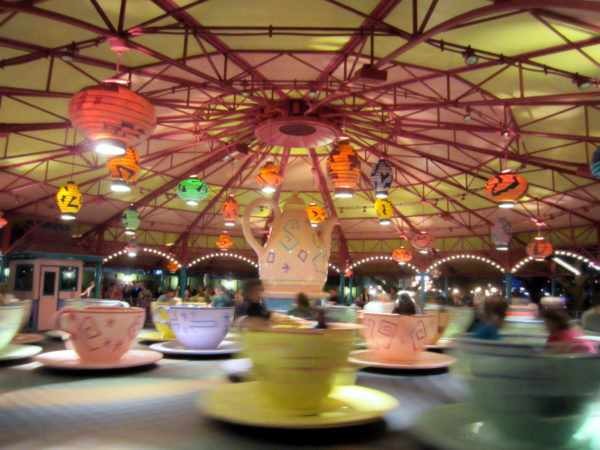 While the ride does spin around and you can spin the tea cup as well, you don’t have to spin your cup. You can just take a leisurely spin around the carousel. Spin around in these over-sized tea cups! Shrink to the size of Alice as you board your cup, and enjoy some time out of the sun. 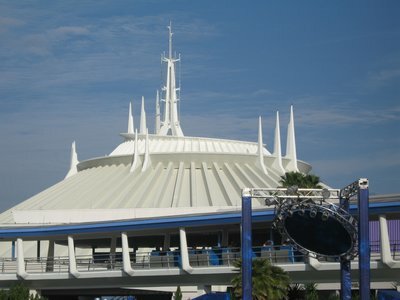 The attraction originally opened without a roof, but the roof was added in 1974 to add shade in the sun and shelter in the rain. The Many Adventures of Winnie the Pooh allows guests to board a hunny pot and float through scenes from the cartoons. You’ll experience a Blustery Day, a bouncing Tigger, a nightmare with Heffalumps and Woozles, and Pooh finally finding some honey. There are lots of interactive activities for young children in the queue like the Hunny wall where you they draw shapes in the honey flowing down the wall, a hide and seek game with gophers and vegetables, and some bars on which they can make honey bees fly. Mickey’s PhilharMagic, in the Castle Courtyard, is a 3D film with 4D effects on a 150 foot screen in a large theater. When you enter and take a seat, you’ll notice that it’s quite chilly inside, a welcome feeling after being in the heat all day. At a few points throughout the show, you’ll even get squirted with water. As the show begins, you find out that Mickey is getting ready to conduct an orchestra, but Donald is sleeping. Mickey gives Donald sheet music and some tasks to complete before the show begins including unpacking the instruments. In the cases, he finds Mickey’s Sorcerer Hat and puts it on bringing the instruments to life. Needless to say, he loses control and the instruments take over. Through a series of hilarious events, we see more characters like Goofy, Aladdin, Lumiere, and Ariel and hear songs from various Disney movies. If you leave without at least a couple of these songs playing on repeat in your head, you’re not a true Disney fan! Peter Pan’s Flight, also in the Castle Courtyard, is based on the Peter Pan movie. You’ll board a pirate ship and fly into the Darling Children’s nursery. There, Peter Pan invites you to fly off to Neverland. Just then, the pirate ship takes off through the window soaring over London and to Neverland where you’ll see the Lost Boys Camp, a Mermaid Lagoon, Skull Rock, and Captain Hook and Peter Pan battling it out on a pirate ship. Of course, Peter is victorious and Hook is left dodging hungry crocodiles! The Disney World version is longer than the one in Disneyland, and the continuous loading in Disney World makes the line movie faster than on the other coast, which is good because the wait is often very long. If this is top on your list, consider getting a FP+. 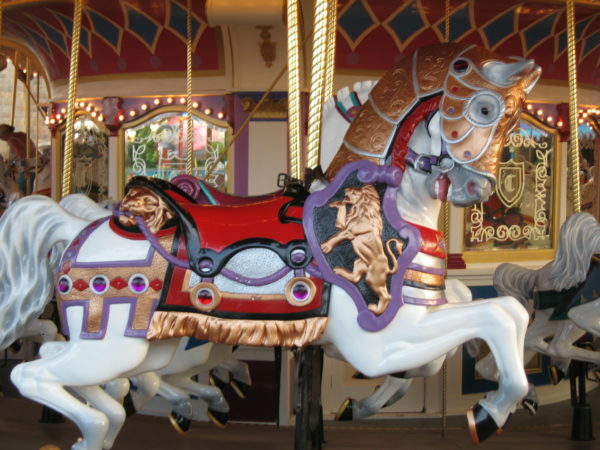 The Prince Charming Regal Carousel is the oldest attraction in Disney World. It started in Detroit, moved to New Jersey, then settled right in the middle of Magic Kingdom in Castle Courtyard. Interestingly, Walt got the idea for Disneyland while watching his daughters ride a merry-go-round at Griffith Park in Los Angeles. Look how beautiful the horses are on Prince Charming’s Regal Carrousel! This attraction was in various stages of disrepair, but the Disney Imagineers restored it to its original beauty with scenes from Cinderella and 90 majestic horses and one chariot. It was an opening day attraction, but it was named Cinderella’s Golden Carrousel at that time. The name was changed in 2010. Mickey’s Royal Friendship Faire takes place on the Castle Stage right at the base of Cinderella Castle. This stage show is fairly new, opening in the summer of 2017. Mickey and his merry makers invite you to join them in a big party to celebrate friendship! 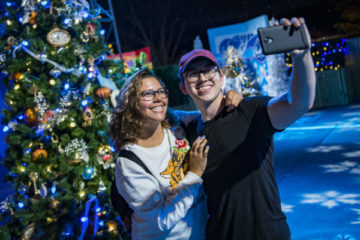 You won’t believe how many Disney characters will join the fun including Goofy, Tiana and friends, Donald Duck and his duckling friends, Daisy, Rapunzel, Flynn Rider, Mickey, Olaf, Anna, and Elsa. With each new character comes a new song and dazzling new effects like fireworks! Merida is one of Disney’s bravest princesses, and you can meet this brave Irish lassie in the Fairytale Garden to the right of Cinderella Castle. Be sure to tell her about your adventures! If you still haven’t met your favorite Disney Princess after meeting Ariel and Merida, head over to Princess Fairytale Hall in the Castle Courtyard. It was part of the expansion of New Fantasyland, and the classic Disney Princesses finally have a home of their own. Inside you’ll find Cinderella and Elena and Rapunzel and Tiana in two separate lines (the characters in this location do change over time, so check your Time’s Guide for the latest offerings). As with Pete’s Silly Sideshow, you’ll have to wait in two lines to see all four, but separating them keeps both lines shorter. Meet your favorite Disney Princesses at Princess Fairytale Hall. Dining in Fantasyland is just as magical as the attractions and other experiences. 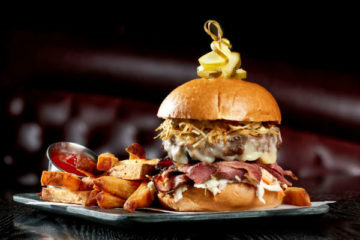 Whether it’s a table-service or a counter-service restaurant, Disney World restaurants are all a step above the rest. Let’s start at Be Our Guest. Enter Beast’s castle in the French Countryside and experience a magical dining experience in a romantic setting then meet Beast and take a picture after dinner. Beast is only available for a meet and greet at dinnertime. He is not there for breakfast or lunch. By day, Be Our Guest is a quick-service restaurant. You place your order at a kiosk, find a seat in the Grand Ballroom, the mysterious West Wing, or the Castle Gallery, and your food is magically delivered to your table. At night, Be Our Guest transforms into a high-end table-service restaurant for which it’s nearly impossible to get an Advanced Dining Reservation. If you’re staying at one of the Disney resort hotels, log into your MyDisneyExperience account at the 180 day mark and try to get an ADR; you won’t regret it. Gaston’s Tavern is named and themed after the antagonist from Beauty and the Beast. You’ll know you’ve arrived at the right location when you see the huge statue of him out front. We may love to hate him, but we love to love his amazing cinnamon rolls, which are probably as big as Gaston’s muscles. He also serves other snacks like veggie cups, hummus and chips, fruit cups, and LeFou’s Brew. 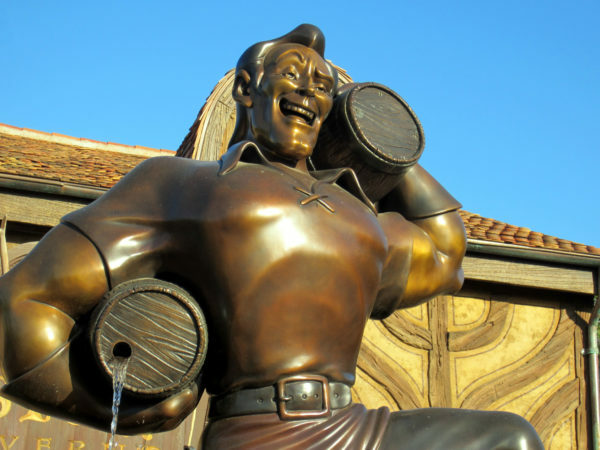 Gaston constructed a huge statue of himself outside of his own tavern. His head is almost as big here as it is in real life! Cheshire Café is a small cottage kiosk selling iced and hot coffee, tea, lemonade, slushes, a Cheshire Cat Tail (a sweet pastry), and pizza frusta with cheese, pepperoni, or sausage. The Friar’s Nook is another food kiosk in Fantasyland, but this one serves meals on the go like BBQ Chicken Macaroni and Cheese, an all-beef hot dog, and regular Mac and Cheese topped with toasted panko bread crumbs. You can also get a variety of hot and cold beverages here. There’s obviously no shortage of snack and quick food in Fantasyland, but it’s worth mentioning that some of it is actually healthy! Prince Eric’s Village Market serves up pretzels and cheese sauce, cookies, pickles, and grapes plus all-natural lemonade, water, and fountain drinks. Just because most of the snacks are healthy doesn’t mean they all are. Storybook Treats offers some amazing sweet treats that will cool you down and fill you up! Check out the hot fudge sundae, a float, a strawberry sundae, or chocolate, vanilla, or swirl soft-serve ice cream. Pinocchio Village Haus is a counter-service restaurant with lots of seating in a quaint cottage. The menu includes a wide selection of sandwiches, flatbreads, pasta, salads, soup, and even chicken nuggets. There’s something here for everyone in the family – even the pickiest eaters! 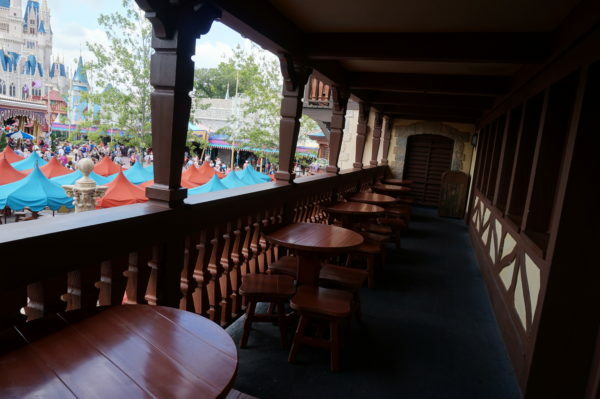 Pinocchio Village Haus has plenty of seating inside on two floors, upstairs on the patio, and in front of the restaurant under colorful umbrellas. We started with a fancy table-service restaurant, and we’re going to end with a fancy table-service restaurant. Cinderella’s Royal Table has been delighting guests for years in a character dining meal on the second floor of Cinderella Castle. If you are lucky enough (and quick enough) to get ADRs for a meal here, you will enter the Grand Hall to meet Disney Princesses and take pictures. Then you’ll be escorted to the grand spiral staircase or to the gilded elevator and head to the second floor. While you dine on breakfast, lunch, or dinner, Princesses visit your table to converse, sign autographs, and take pictures. The meal is expensive and it takes quite a long time, but it’s an amazing experience! If you’re visiting with a young child, consider visiting either the Bibbidi Bobbidi Boutique for girls or the Pirate’s League for boys where they’ll dress up. What’s your favorite part of Fantasyland?